Arrival Leh Kushok Bakula Airport (3500 m / 11565 ft above sea level). Upon arrival at Leh Kushok Bakula Airport welcome and meet by our representative and transfer to Hotel/Guest for check in wherein welcome tea and coffee will be served. Complete half day rest at hotel for acclimatization as it is important at the height of Ladakh. Lunch will be served at 2:00 PM. Afternoon around 3:30 PM sightseeing to Shanti stupa, and 17th century Leh palace. Dinner & overnight at Leh in Hotel. Full day sightseeing of Indus valley monasteries. (47 Km one way - Round 94 km – 5/6 hrs). Today after breakfast around 8:30 AM leave to full day sightseeing of Indus valley, 16th century Shey palace, 14th Thiksay monastery and 17th century Hemis monastery. Sightseeing start with 17th century Hemis monastery 47km from Leh. On the way stop to take the photos of picturesque view of 16th century Shey palace and 14th century Thiksay monastery. You arrive at Hemis monastery around 10:30 AM. 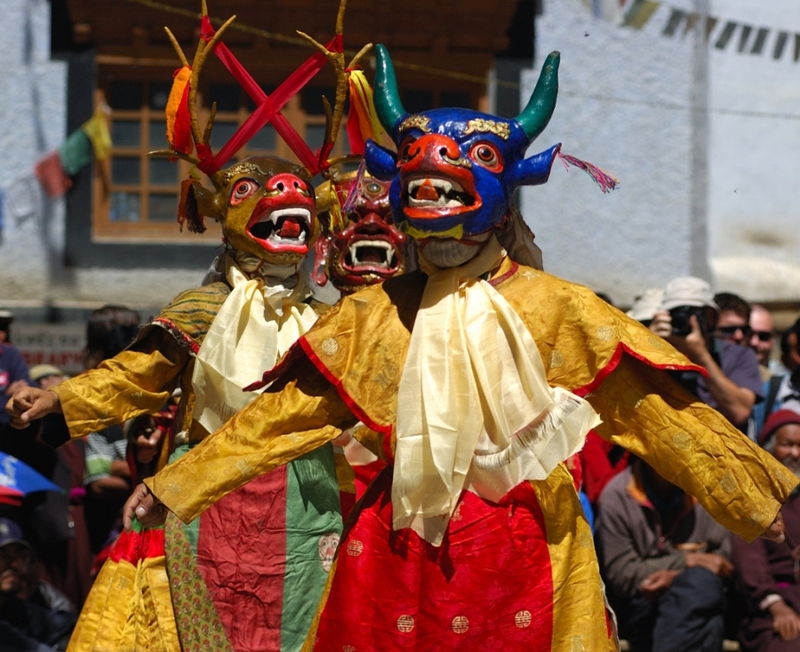 Hemis is the biggest monastery of Drukpa Kagyud Sect. After visiting Hemis monastery drive to Thiksay monastery on the same way back. Lunch at Thiksay in restaurant. Post visit Thiksay monastery and Shey palace. After Shey palace drive back to Leh you will reach Leh around 5:30 or 6:00 PM. Overnight at Leh in Hotel. Nubra valley – Leh by same route (125 km – 5/6 hrs). Today after breakfast at 9:00 AM check out from hotel and drive back to Leh by same route. Stop at Kardung village for short hike in the middle of barley field and take the photos of charming Kardung village. After short hike lunch at Garden restaurant of Kardung village. Post lunch drive to Leh. You will arrive at Leh around 3:00 PM or 4:00 PM. Evening free to explore the Leh market. Overnight at Leh in Hotel. Leh – Likir - Alchi village (Sham Valley 75 km – 4/5 hrs). Today after breakfast at 8:00 AM leave to Alchi monastery drive downstream along the River Indus on Leh – Srinagar (Kashmir) Highway. 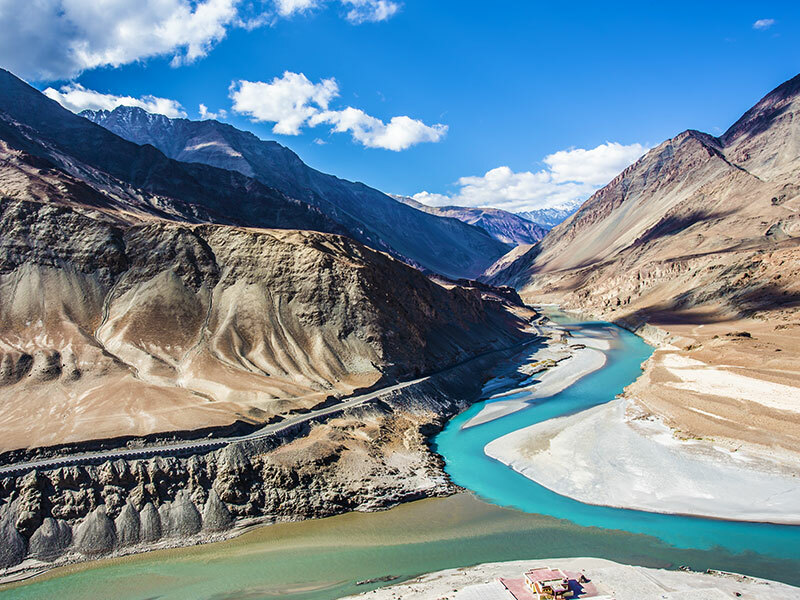 Enroute visiting, Hall of fame Museum, Gurudwara Pathar Sahib, and Magnetic hill which defies the law of gravity and panoramic view of confluence of Indus – Zanskar River. Likir monastery, Likir monastery is second biggest Gelugpa sect monastery in Ladakh after Thiksay monastery. After Likir monastery drive to 11th century Alchi Choskor monastery. Lunch at Alchi village in garden restaurant. Post lunch around3:00 PM visit 11th century Alchi monastery and hike around the village. Dinner & overnight at Alchi village in Hotel. Alchi – Leh via Lamayuru (Sham Valley 180 km 5/6 hrs). Today after breakfast around 8:00 AM back to Leh enroute visiting the mesmerizing Lamayuru landscape popularly known Moon Landscapes among tourist. (You will believe why the name of this area is Moon land. Exactly the same formations of land are visible as on the moon). A drive of another 1 km took us to Lamayuru monastery. After visiting Lamayuru monastery drive back to Leh on the same way back stop at Kaltse village market for hot lunch in restaurant. After lunch at Kaltse drives another 20 km visit Rigzong monastery and Nunnery school at Rigzong. After Rigzong drive straight back to Leh. You will arrive at Leh around 5:00 PM or 6:00 PM. Evening explores the Leh market by own. Overnight at Leh in Hotel. Leh – Pangong Lake – Leh (Round 280 km – 10/12 hrs). Today after an early morning breakfast at 5:00 AM leave to Pangong Lake enroute visit Thiksay monastery and attend Morning Prayer of monks in the main assembly hall of the monastery and visit Shrine rooms of monastery after that drive to Pangong Lake passing through Chang-La pass 5486 Mtrs above sea level. Stop at the Chang-La pass for a short moment to takes the photo o panoramic view Chang-la pass glacier and drive down to the of Tangtse, the main nomadic village of Changthang region. From Chang-la pass to Pangong lake drive through panoramic landscapes. You will arrive at Pangong Lake around 12:30 PM. Hike around the lake to explore the beauty of lake. Hot Lunch at Pangong Lake in restaurant. After lunch drive back to Leh enroute visit Chemrey monastery. You will arrive at Leh around 5:00 PM or 6:00 PM. Overnight at Leh in Hotel.